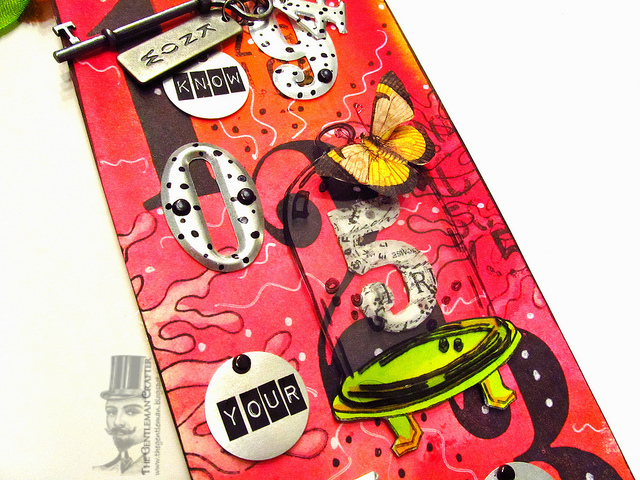 In between reworking the top hat, I pulled out a tag...It's just what I do...LOL! I sprayed the tag with some Dylusions Spray Inks in Bubblegum Pink, Squeezed Orange, Pure Sunshine and a dash of Cherry Pie. I then added the numerals from Tim Holtz new Stampers Anonymous Numeric stamp set, added a bit of the new Dylusions Ocean Backgrounds stamp around the edges, bradded on some Tim Holtz-Idea-olgy Numerals...Not being quite done, I stamped the domed plate from Dylusions Monster Mash stamp set onto Acetate and Ranger's Inkssentials Manila card and cut each out to match the original stamped image. I placed a tissue taped #5 under the dome then headed to my box of goodies and pulled out a key, another mini numeral and the "Know" Idea-ology Word Sticks and attached it to some Dylusional stained Crinkle Ribbon....Last but not least added some Idea-ology Label Letters spelling out..."Know Your No." to some aluminium tags. Y'all Have An Awesome Day! Gorgeous tag, love the colours. Loving the tag. Whenever I see a creation using dylusions it always makes me happy & your tag certainly does. Am looking forward to your "lady of steam pumk something or other" with top hat. It sounds cool. Thanks for making me smile on a cold wet miserable morning in the UK. Very much appreciated. Wow! Wow! Wow! Lovin' this tag, Jim. Its just what you do Jim ..lol bright colours just what we need here in the UK at the mo with all the wet n snowy spring were having lol so your bright n cheery tag has the right effect .. great job :o) M.
Hi Jim, Lovin' your tag. It took me back to memories of 'The Prisoner' - a T.V. series about a British former secret service agent held prisoner in a mysterious costal village resort, where everyone is referred to by a number & not their name. I think they re-made it for U.S. viewing. How did you get an air-brushed look with the Dylusions sprays? I was expecting you to say you used ink pads & a blending mat. Amazing ........ it's just what you do ........... and we love it. Wowie, this is crazy good! Love how you just work at it adding bits here and there until a masterpiece is born. The background colors are fantastic. Thanks for sharing. I LOVE this tag! SO colourful and funky!!! What a cheerful, colourful tag - just what I need on a snowy day like today. I've just had a job interview which didn't go well, so I needed cheering up - thank you Jim. Your beautiful mind must never stop! Love, love the tag. Such a great tag! Love the colors and the fun numbers etc. Such a happy feel! Another "just fun" tag...it's just what you do...LOL! Love the bright and happy colors. I don't know how you always come up with such fun and playful ideas!! Wow, I love your tag, so much dimension and color! Where are the top hat pictures? I would love to see it. I can't wait to see your steampunk lady. I too got to play last night and started my first mixed media canvas, so far so good. I hope your Friday goes smooth so you can get your craft on! I'm glad you "just do what you do!" 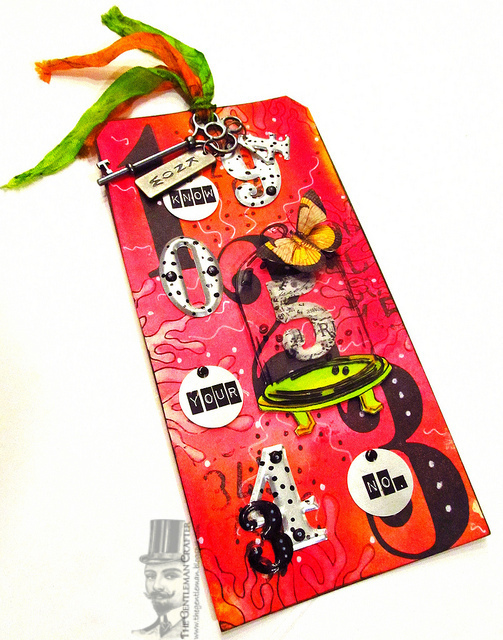 It produces such outstanding results; love the tag and its vivid colors contrasted against the numbers. It is quite phenomenal how you can get so many different images on one tag and make them mesh seamlessly. Thanks for sharing your talent, Jim. When you're doing just what you do, great things happen. Terrific tag!The background is awesome. Wow Jim... I love bright colors and this is right up my alley! You did a fabulous job once again adding Dyan's and Tim's goodies into one project! I can't wait to see your Steampunk Lady with Her Top Hat! I hope you have a fabulous and creative weekend! 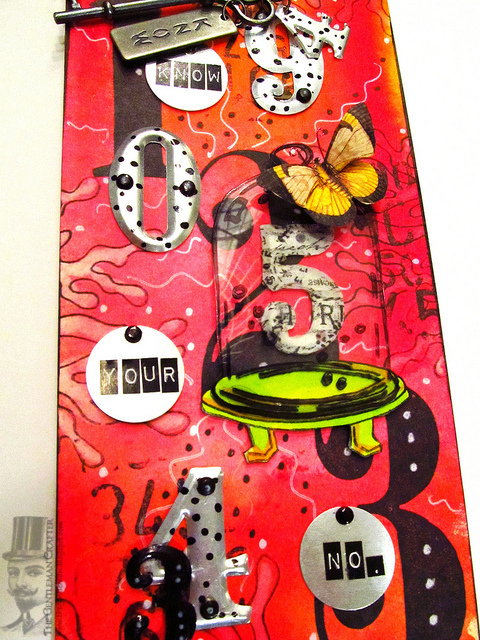 OF COURSE I LOVE YOUR TAG....GREAT COLORS....LOVE THE NUMBERS.....OOOOO CAN'T WAIT TO SEE YOUR ALTERED LADY! Whatever did we do before all these great sprays? Can't live without them now! A great tag to wake up to! Jim... I don't know what to say ... too cool !! Can't wait to see the statue ! Just plain fun. Love it. thanks as always for sharing. You will be showing us how to do the top hat at sometime-I really really hope! Fabulous tag! I'm really interested to see the steampunk lady with the top hat!